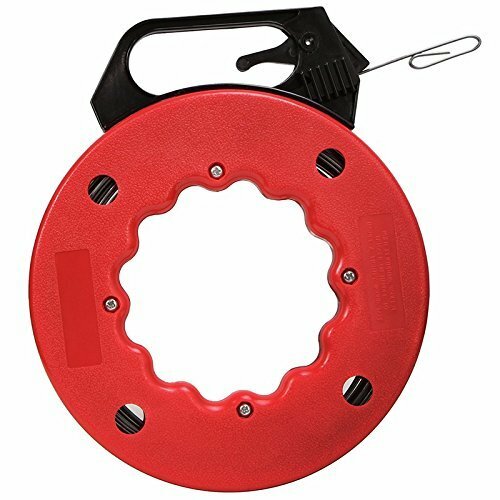 Katzco's heavy duty electrical fish tape reel is the solution for you. This product provides superior quality. Tape is 1/8'' W x 1/16'' thick x 50 feet. The case and handle are extremely durable and offer the maximum in shock and impact resistance. The inner ring design provides a smooth, consistent and comfortable surface for winding and rewinding and allows for more accurate use. For quick hand-over-hand rewinds and allows a more level payout of tape on the backswing while feeding conduit. It also stores excess tape. The handle gives you firm grip when pulling wire. The convenience, quality and ease of use of this product is unmatched!